If you have ever watched President Obama speak from the Oval Office, you may have noticed sitting near a Frederic Remington bronze on a bookshelf is a volcano shaped black on black classic pot made by Maria Martinez. This piece was acquired during the Johnson administration and has been sitting with presidents ever since. Maria, her son Popovi, and grandson Tony Da were guests of Lady Bird Johnson, the first lady in 1967. Maria received worldwide accolades throughout her life and is considered to be the most famous pueblo potter, a title richly deserved. Working with her husband Julian from the turn of the early 20th century until his death in 1943, Maria and Julian made a great team with Maria making and polishing the pots and Julian painting the designs and firing the pottery. 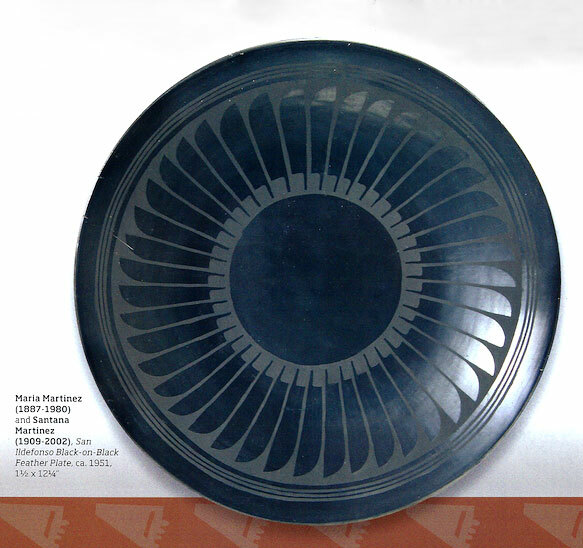 In 1919, Julian invented the matte-black-polished pottery that would become Maria’s trademark for nearly a half century. This black on black technique is now considered to be the traditional style of pottery at both Santa Clara and San Ildefonso pueblos. Until this radical change to black color, polychrome vessels were the mainstay at San Ildefonso. Ironically, early Maria polychrome vessels now bring significant money, because of their scarcity, especially if they are signed; a polychrome bowl with a lion motif sold last month at auction for $31,250. It isn’t often realized by the lay public that Maria rarely worked alone when making pottery; it was her collaborators who also helped advance her pottery to a high level of artistry. The time frame during which Maria’s pots were made can be identified by the way she signed her name. She started using the signature “Marie” in 1923 and probably used this until the late twenties or even early thirties. 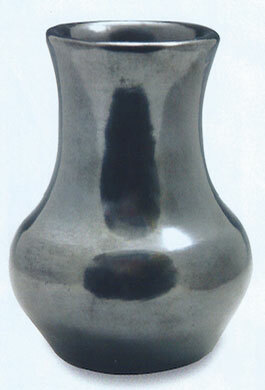 Even though the single “Marie” signature was used, the pottery was always made in coordination with her husband Julian. Maria then changed her signature chronologically to “Marie and Julian” and after Julian’s death, she worked with her daughter-in-law Santana, signing “Marie and Santana,” until 1956. Starting around 1956, Maria stopped signing her pots with an “e” and changed to “Maria.” It was during this time frame she signed her pottery either “Maria Poveka,” if she made them by herself, or “Maria/Popovi” if her son Popovi helped. Popovi, who died in 1971, collaborated with Maria to create some of her most unique pieces, including creating a new color sienna, which he originally called carmel, in 1961. He perfected the gunmetal finish, which is exceptionally hard to achieve, as it requires a very hot fire that increases the risk for pot breakage. Popovi also was the first to add turquoise to his pottery surfaces, something now commonly done at many of the pueblos. Maria and Popovi’s pots are considered by many collectors to be some of Maria’s best and most innovative work, and prices have consistently reflected this perception. Medicine Man Gallery, which has long specialized in the lifework of Maria Martinez and her family, will be having their 16th annual Maria Martinez and Family Show and Sale this summer in Santa Fe during August with over 50 pieces.